Books at Valhalla Books. Photo by Daniel Hirsch. In a Mission Street building of unique and specialty bookstores, one will soon be no more. 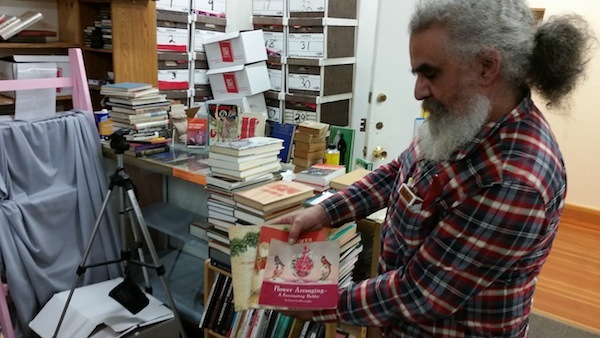 Valhalla Books, which has been in operation on the second floor of 2141 Mission Street since 1998, will be closing in either February or March, according to its owner and sole employee Joe Marchione. “I picked the wrong century to sell books,” Marchione said Thursday afternoon from the confines of his cozy and jam-packed store. 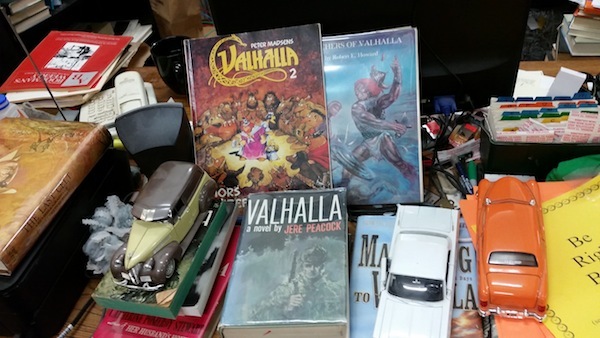 The store’s large and eclectic collection—roughly 12,500 volumes, according to Marchione—will all be deeply discounted over the next few weeks, as Valhalla goes out of business. The building, which also houses Bolerium Books, Libros Latinos and Meyer Boswell Books, has gained some notoriety over the years as a hub for book seekers with discriminating and oddball tastes. Marchione says he still gets customers who read about his store in a 2010 New York Times story about San Francisco’s literary landscape. Chinese tourists frequent the building due to persistent, loving coverage from a Taiwanese journalist named Fang Ling Jong who writes about old American bookstores. By 2006 all three other Valhalla partners had moved on, but Marchione steadfastly remained. His collection of first-print novels, antique literary magazines, and various curios blossomed, but, like so many bookstores grappling with the effects of online retail, the business never caught on. Joe Marchione shows off his collection at Valhalla Books. Photo by Daniel Hirsch. The love is present in Marchione’s eyes as he walks around his soon-to-be-gone business. He displays a rare engineer’s guide to the 1906 earthquake published by the Roebling Construction Company. He flips through a flower arrangement instruction book from the 1950s published by Coca Cola and written by Laura Lee Burroughs, whose son would later become the anarchic beat William S. Burroughs. He shows off an unpublished galley copy of a poetry collection by the Pulitzer Prize winning Audrey May Wurdemann. “This is the most inappropriately named business, we’re called booksellers, but really we’re book buyers. I love buying books,” Marchione said. “Even as I’m going out of business, I’ve been in thrift stores every day this week looking for books.” He says he just might find a first edition, first print of To Kill a Mockingbird, “again, the rescue fantasies,” he adds self-deprecatingly. There’s also a fraternal love present among the booksellers at 2141 Mission Street. Valhalla offers free cups from its Mr. Coffee to anyone that enters the shop, which on an almost daily basis includes the owners of the other book businesses in the building. As he sipped his Valhalla coffee of the afternoon John Durham, the sometimes prickly owner of Bolerium Books which specializes in rare and out-of-print books from radical social movements, said he was going to miss Valhalla. Before it was filled with bookstores, starting in 1985 when Bolerium moved in, Marchione and Durham explain that 2141 Mission was a building of sweatshops. Durham says he remembers an evening when the building was raided by federal agents breaking into a warehouse of fraudulent Nikes. Marchione agrees. “The more specialized you are, the more successful,” he said. He added that he thought Meyer Boswell, which exclusively sells its antiquarian law books online, and Libros Latinos, which sells books and journals from Latin America and the Caribbean, will have some staying power because of their niche audiences. Valhalla, with its more general collection of interesting finds, is not long for this world. For the next few weeks, Valhalla Books is located at Suite 202 of 2141 Mission Street, ring to be let in or “if the Paint Store is open, you can cut though and come up.” Joe Marchione shares his knowledge about old books online here and here. Weird tales at Valhalla Books. Photo by Daniel Hirsch. NextThank you Local Mission Market!